The Wiener takes it all. 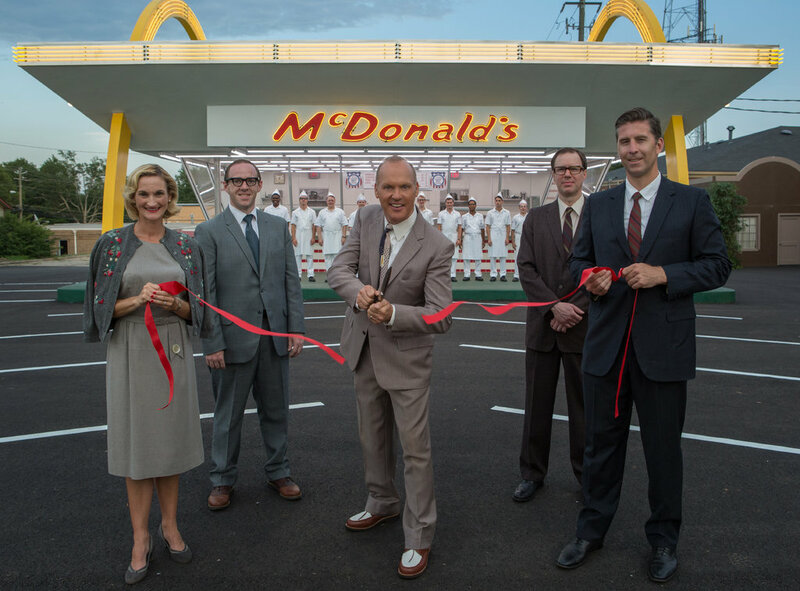 In his 50’s, Salesman, Ray Kroc (Michael Keaton), decides to switch up his living, from selling milkshake mixers, to becoming the head of the infamous fast food giant, McDonald’s. He soon forces the McDonald brothers out of their own business, and steals the spotlight all for himself. John Lee Hancock directs an infuriating biopic where, ‘I’m lovin’ it‘ remains as merely the slogan for McDonald’s…not the line you will utter to yourself when immersed in the film itself. The film displays the corporate greed in the USA, and how this man manages to get away with it. You’d think that would make for a fascinating film, right? The Founder is quite like the gherkin you find in the middle of a cheeseburger; no one is enthused by it. Considering its unique premise, the film fails to wet one’s appetite like it should. Michael Keaton gives off a strong performance, but isn’t spectacular, nor does it lie in his top performances. He plays, what can be seen as an inspiring businessman, but also a complete fool at the same time. Several parallels can be drawn to the more recent, Donald Trump. On a technical level – and with a protagonist as detestable as this, technicalities are everything. The issue being, the camerawork is nothing short of bland – it is in need of a little more ‘oomph’ and focus. There isn’t a large issue with the film, but there is also nothing particularly striking about it either. Hancock nonetheless evokes the 50’s vibe particularly well. It is guaranteed that you will be craving a burger after watching this, but not necessarily one from McDonald’s. The Founder demonstrates how ruthless the business world can be, and settles for a frustrating biopic. A truly interesting narrative – though not so ‘supersized’ when it comes to drama, running at a painfully slow pace. I actually really liked this movie and thought it was one of the best-made of the year. I thought Keaton’s performance was Oscar-worthy and was hoping he’d get a nomination. But you’re right, it just shows how bad corporate greed is and how destructive it can be. It made me think about whether or not I wanna boycott McDonald’s from now on to pay tribute to the brothers who got their dream stolen from them. Just as I thought – passable, but still by-the-numbers. Maybe I’ll check it out sometime down the road, but for now, it certainly isn’t on the top of my watchlist! Didn’t particularly spark my interest either…Keep it towards the bottom of your watchlist – there is certainly no rush!